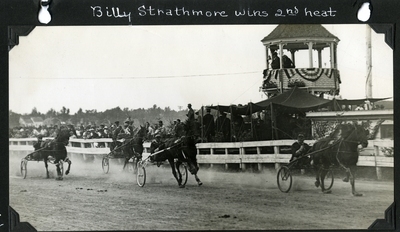 Black and white finish line photo of bay gelding Billy Strathmore, Pottle up, winning the second heat of the 2.12 Trot and Pace on August 27, 1931 at the Eastern Maine State Fair, Maplewood Park, Bangor, Maine. Billy Strathmore won the $500 purse in three straight heats. Also pictured in this photo: Sister Napoleon finishing second; Kinney Silk in third; and Peter Mangus in fourth. Note the judges stand in the background draped in bunting and decorated with boxes of geraniums.